Hand washing, what a great game! (Open 6 steps for hand washing) Print, laminate, and display near the sink. Use the motivational chart each time children wash their hands. We suggests an imaginary game to begin each day. 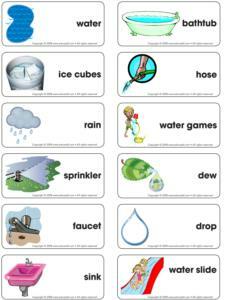 (Open thematic letter - Water games) Print the letter and prepare a special envelope. Hide the envelope in an easy to find location in the daycare. During circle time, have children find the letter and read portions of the interactive story to them. Follow the instructions. Have children reflect on the different ways we use water with these open questions. In nature: to feed plants, trees, and animals, to fill lakes and rivers. For swimming, water skiing, wind-surfing. Use small inflatable pools to transform certain areas. For example, in the doll or building block corners, place the toys in the pools. Children will love sitting in the pools to play. Draw giant raindrops and hang them from the ceiling. Tie several transparent balloons together and hang them in the daycare using transparent thread. The pictures may be used as a memory game or to spark a conversation with the group. Use them to decorate the daycare or a specific thematic corner. 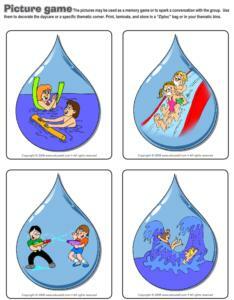 (Open picture game - Water games) Print, laminate, and store in a "Ziploc" bag or in your thematic bins. Turn your sandbox into a mud area on a Friday so it will have time to dry over the weekend. Use two buckets. Fill one with water. Have children transfer water from one bucket to the other using sponges, eyedroppers, measuring cups, etc. Sit in a circle. While you sing a song, children pass a water balloon around the circle. When the song ends, the child holding the balloon gently throws it to the child sitting in front of him. Fill a large bowl with water. Children attempt to catch a floating apple using only their teeth. The child who succeeds is the winner. He may eat the apple. Be sure to use a different apple for each child. Build rowboats using large cardboard boxes. Let children paint their boats with poster paint. Deposit the rowboats on a large piece of clear plastic. Children sit in their boats and pretend to row using foam noodles (used in pools). They can even take along a fishing rod. Deposit three hoola hoops close together on the ground (or trace three circles with rope). Children stand in a circle around the hoops. One at a time, they must cross over the hoops to the sound of rhythmic music. When the music stops, the child who was crossing the river becomes a fish. He can make fish faces and sounds. The game continues until all the children are fish. Fill a basket with water balloons. Make two teams and give each team an empty basket. Determine a start and finish line. Children are to transport water balloons between their legs to their team's basket at the finish line. Deposit hoola hoops on the ground to represent rocks in the river. Children hop from one rock to the next. Use masking tape to draw two parallel lines on the ground. Deposit aluminum plates filled with water between the two lines. Have children cross the river without touching the water. Provide children with buckets of water and paintbrushes. Children can "paint" fences, porches, and even the house! Prepare small water balloons. Put them in the pool. Let children catch them using large plastic spoons or plastic shovels. Play relaxing music with wave or water sounds. Line up plastic bottles. Throw water balloons to make the bottles fall down. Place a balloon on a table or chair. One at a time, children try to make the balloon fall off using a water gun. Children sit in a circle. One child walks around the circle. He stops behind another child and gently wrings out the sponge over his head. The child who gets wet must quickly stand up and run after the child who wrung out the sponge. If he does not touch him before he gets back to his place, it is then his turn to walk around the circle with the sponge. Deposit one hoola hoop on the floor for each child. Dramatically explain to the children that they are raindrops. Have them describe their voyage down to the ground. Take a stroll in the rain. Touch the rain and describe how it feels. Look at the sky and observe the shapes of the clouds. Gather rainwater in buckets and observe it. Jump over rain puddles. Search for worms. Place mats and blankets near a window. Relax while listening to the rain. Play music and discuss the traditional rain dance. You will need 6-8 glass jars. One jar should be empty and the other jars should all have different levels of water in them. The last jar is full. Add a few drops of food colouring to the water so children can see the different levels. Let children discover the different sounds produced by tapping the jars with wooden spoons and metal spoons. Line up the jars in order, from the empty jar all the way up to the full jar. The empty jar produces the highest pitch and the full jar produces the lowest pitch. Variation: You could use different objects such as cans, plastic containers, etc. Children will understand that different objects produce different sounds. Draw a cloud on a large piece of blue paper and a sun on a large piece of yellow paper. Have children search for pictures which correspond to good weather and bad weather in magazines or catalogues at home. Rain boots, umbrellas, bathing suits, swimming pools, t-shirts, or any other objects will do. Parents can help thei r children. During circle time the next day, have children associate their pictures to the sun or the cloud. 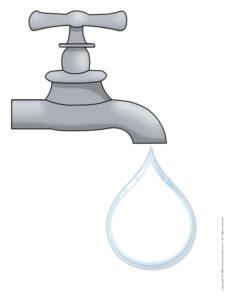 (Open game - Faucet) Print, laminate, cut out, and hang the faucet on the wall. Give each child one laminated droplet of water. Blindfold children one at a time. Have them attempt to stick their droplet of water as close as possible to the faucet. Have children help you clean the dolls. If possible, this activity may be done outdoors. Use large containers or a small pool. You will need soap, facecloths, and large towels. Children may also wash the doll clothes and hang them to dry on a small clothesline. Pour water into a shallow container. Shake pepper onto the water. Add a drop of dishwashing liquid. What happens? Prepare bubble solution by combining dishwashing liquid and water. Add a teaspoon of vegetable oil for stronger bubbles. Show children how to make a bubble wand by twisting a pipe cleaner. Variation: Pour bubble solution into aluminum plates. Add a different colour of food colouring in each plate. Have children blow bubbles onto light construction paper. This is a great activity for a hot sunny day. ollect objects that will float and others that will sink. Children will enjoy guessing which ones will float prior to depositing them in the water. Enjoy pouring and transferring water. Use glasses and prepare mixtures such as water and vinegar, water and pepper, water and soda, etc. Observe the results. Gather several transparent jars, water, and different substances such as sand, mud, gravel, etc. Deposit different substances into each jar and fill them with water. Shake the jars. Notice how each substance reacts with the water. Which one takes the longest to settle? Which one quickly returns to the bottom of the jar? Variation: Fill a single jar with layers of different substances and fill it with water. Shake the jar and let the substances settle. What happens? Which substance is heaviest? Which substance is lightest? Give each child a spray bottle filled with water. Go outdoors for this experiment. Stand with your back to the sun and spray. Observe the result with the group. Children should see colours in the water. This is the perfect occasion to discuss rainbows. (Open poster - hot and cold water) Print and use to identify your faucets. Prepare two glasses of water, one containing cold water and one containing lukewarm water. Have children feel the temperature of the water in each of the glasses. Add an ice cube to each glass and let children observe how quickly they melt. Let children help you wash vegetables. Have children make "Jell-O", juice, popsicles, etc. Serve water in glasses. Provide children with straws and let them make bubbles. Cover the table with newspaper. Give children paintbrushes and water. Let them paint using water only. You can offer clear or coloured water. Use paper muffin cups and pipe cleaners to craft small umbrellas. Children can colour or decorate them as they wish. 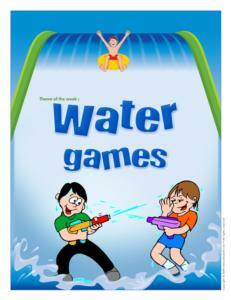 (Open coloring pages theme - Water games) Print.